Malta’s fine arts museum and Valletta 2018 flagship project Muża was officially inaugurated on Saturday evening, months behind its original deadline but just in time to host an international conference next week. The newly-opened museum, situated at the Auberge d’Italie on Merchants Street, includes items from the fine art collection at the former national gallery in South Street, as well as new acquisitions. Its story content can be classified in four parts, Mediterranean, Europe, Empire, and the Artist. The museum’s collection has well over 20,000 works of art. Renovations to the historic building included provisions to ensure it is energy-efficient as well as climatic control to protect the artwork on display. A number of video displays will explain works and how they were made to visitors. Plans to develop the museum were announced in December 2013, but works on the €10 million project took far longer than expected, with completion deadlines slipping back by months. According to sources, delays were primarily due to architectural discoveries during construction, which forced planners to redesign sections of the building and obtain fresh clearance from UN cultural agency UNESCO. 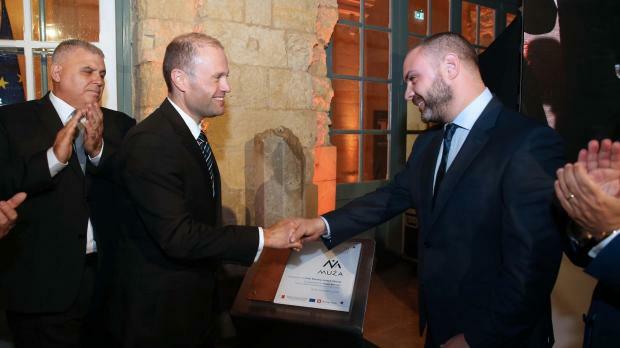 Prime Minister Joseph Muscat opened the museum with a brief speech on Saturday evening, noting that the Auberge – originally intended for the Knights and nobility and subsequently used by government departments – would now be a public space, for all to enjoy. Muża will now host the annual conference of the Network of European Museum Organisations, which is due to begin on November 15, before opening its doors to the public the following week.